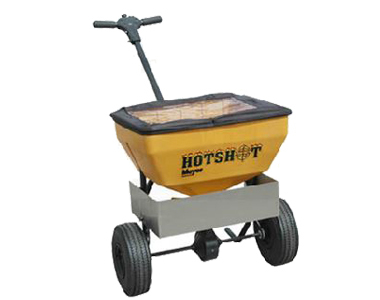 Use this Meyer Hotshot 70 All Season Spreader for all types of materials including, sand, salt, limestone, fertilizer, and other granulated materials for year round use. Fill the 0.90 cu. ft. hopper up to 70 lbs. for reduced fill up times. Spread up to 12 feet and keep materials from spreading in unwanted places with the salt shield. And, an easy-to-read dial allows you to adjust the material flow on the outside of the hopper. 70 lb. Capacity: Carry up to 70 lbs. of material with you in the 0.90 cu. ft. poly hopper. Spreader Width: Spread the material at a maximum width of 12 feet to cover as much ground as possible. Material: Get year round use with this spreader by spreading sand, salt, limestone, fertilizer, and other granulated materials. Spreader Cover: Protection from the elements is offered with the to keep materials dry and free flowing. Salt Shield: Keep materials from spreading in unwanted places. Self-Lubricating Bearings: Excellent load-carrying performance and wear is provided by the self-lubricating axle and wheel bearings. T-Handle: Easy to operate with a T-handle that also features a push-button shut-off. Easy-Read Dial: An easy-to-read dial allows you to adjust the material flow rate from the outside of the hopper. 12" Heavy Duty Tires: Enhanced traction and ice-gripping tread is available with the 12 inch heavy duty tires. One Year Warranty: Feel assured with the one year warranty. Ask us about the Meyer Hotshot 70RD All Season Walk-Behind Broadcast Spreader. Please no repair questions. Your Q&A may be posted to SnowblowersAtJacks.com to help other shoppers, like you, with their purchasing decisions. Thank you.